Skywatchers this weekend will get two special, subtle treats: a penumbral lunar eclipse on Friday (Feb. 10) and a strange green comet reaching its peak viewing time the following morning. First, February's full moon — the "snow moon" — will pass through the edge of the Earth's shadow, which is called the penumbra. During this "full snow moon eclipse," the moon will be completely shaded, making the change easier to see, although it won't stand out as much as a typical lunar eclipse when the moon passes deep into the heart of Earth's shadow, called the umbra, and turns a ruddy color. Meanwhile, Comet 45P/Honda-Mrkos-Pajdusakova will be visible in the predawn hours by skywatchers using binoculars or small telescopes between Thursday and Sunday, in the constellation Hercules in the eastern sky. The comet's closest approach will come on Saturday, when the object will pass just 7.4 million miles (12 million kilometers) from Earth. While that's 20 times the distance to the moon, the comet's approach is close by celestial standards. 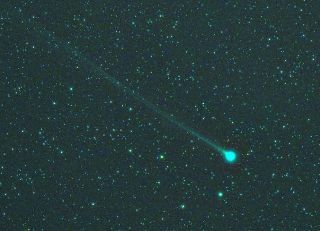 Comet 45P will appear blueish-green due to vaporizing diatomic carbon, which appears green in space's near-vacuum conditions. Astronomy broadcasting service Slooh will have two shows related to the eclipse and the comet. "The Full Snow Moon Eclipse" will broadcast on Feb. 10 at 5:30 p.m. EST (2030 GMT), and "Cruise the Galaxy with Comet 45P" will broadcast the same night at 10:30 p.m. EST (0330 GMT Feb. 11). You can also watch both of the broadcasts here on Space.com, courtesy of Slooh. The penumbral lunar eclipse is visible nearly worldwide, except for in Hawaii, Australia, New Zealand and countries along the coast of the Pacific in east Asia. The moon will enter Earth's shadow at 5:32 p.m. EST (2232 GMT) and leave at 9:55 p.m. EST (0255 GMT on Feb. 11); the peak eclipse takes place at 7:43 p.m. EST (0034 GMT on Feb. 11). The moon will be harder to see in most of North America, because the full moon will still be rising at that time, while East Asian viewers will have a setting moon during the eclipse. It will be best visible in areas with little light pollution and a horizon unobstructed by buildings, mountains or trees.